This article provides information that you need to synchronize your user passwords from an on-premises Active Directory instance to a cloud-based Azure Active Directory (Azure AD) instance. The Active Directory domain service stores passwords in the form of a hash value representation, of the actual user password. A hash value is a result of a one-way mathematical function (the hashing algorithm). There is no method to revert the result of a one-way function to the plain text version of a password. You cannot use a password hash to sign in to your on-premises network. The actual data flow of the password hash synchronization process is similar to the synchronization of user data. However, passwords are synchronized more frequently than the standard directory synchronization window for other attributes. The password hash synchronization process runs every 2 minutes. You cannot modify the frequency of this process. When you synchronize a password, it overwrites the existing cloud password. The first time you enable the password hash synchronization feature, it performs an initial synchronization of the passwords of all in-scope users. You cannot explicitly define a subset of user passwords that you want to synchronize. When you change an on-premises password, the updated password is synchronized, most often in a matter of minutes. The password hash synchronization feature automatically retries failed synchronization attempts. If an error occurs during an attempt to synchronize a password, an error is logged in your event viewer. The synchronization of a password has no impact on the user who is currently signed in. Your current cloud service session is not immediately affected by a synchronized password change that occurs, while you are signed in, to a cloud service. However, when the cloud service requires you to authenticate again, you need to provide your new password. A user must enter their corporate credentials a second time to authenticate to Azure AD, regardless of whether they're signed in to their corporate network. This pattern can be minimized, however, if the user selects the Keep me signed in (KMSI) check box at sign-in. This selection sets a session cookie that bypasses authentication for 180 days. KMSI behavior can be enabled or disabled by the Azure AD administrator. In addition, you can reduce password prompts by turning on Seamless SSO, which automatically signs users in when they are on their corporate devices connected to your corporate network. The following section describes, in-depth, how password hash synchronization works between Active Directory and Azure AD. Every two minutes, the password hash synchronization agent on the AD Connect server requests stored password hashes (the unicodePwd attribute) from a DC. This request is via the standard MS-DRSR replication protocol used to synchronize data between DCs. The service account must have Replicate Directory Changes and Replicate Directory Changes All AD permissions (granted by default on installation) to obtain the password hashes. Before sending, the DC encrypts the MD4 password hash by using a key that is a MD5 hash of the RPC session key and a salt. It then sends the result to the password hash synchronization agent over RPC. The DC also passes the salt to the synchronization agent by using the DC replication protocol, so the agent will be able to decrypt the envelope. After the password hash synchronization agent has the encrypted envelope, it uses MD5CryptoServiceProvider and the salt to generate a key to decrypt the received data back to its original MD4 format. The password hash synchronization agent never has access to the clear text password. The password hash synchronization agent’s use of MD5 is strictly for replication protocol compatibility with the DC, and it is only used on premises between the DC and the password hash synchronization agent. The password hash synchronization agent expands the 16-byte binary password hash to 64 bytes by first converting the hash to a 32-byte hexadecimal string, then converting this string back into binary with UTF-16 encoding. The password hash synchronization agent adds a per user salt, consisting of a 10-byte length salt, to the 64-byte binary to further protect the original hash. The password hash synchronization agent then combines the MD4 hash plus the per user salt, and inputs it into the PBKDF2 function. 1000 iterations of the HMAC-SHA256 keyed hashing algorithm are used. The password hash synchronization agent takes the resulting 32-byte hash, concatenates both the per user salt and the number of SHA256 iterations to it (for use by Azure AD), then transmits the string from Azure AD Connect to Azure AD over SSL. You can also use the password hash synchronization feature to synchronize your on-premises passwords to Azure Active Directory Domain Services. In this scenario, the Azure Active Directory Domain Services instance authenticates your users in the cloud with all the methods available in your on-premises Active Directory instance. The experience of this scenario is similar to using the Active Directory Migration Tool (ADMT) in an on-premises environment. When synchronizing passwords, the plain-text version of your password is not exposed to the password hash synchronization feature, to Azure AD, or any of the associated services. User authentication takes place against Azure AD rather than against the organization's own Active Directory instance. The SHA256 password data stored in Azure AD--a hash of the original MD4 hash--is more secure than what is stored in Active Directory. Further, because this SHA256 hash cannot be decrypted, it cannot be brought back to the organization's Active Directory environment and presented as a valid user password in a pass-the-hash attack. When password hash synchronization is enabled, the password complexity policies in your on-premises Active Directory instance override complexity policies in the cloud for synchronized users. You can use all of the valid passwords from your on-premises Active Directory instance to access Azure AD services. If a user is in the scope of password hash synchronization, the cloud account password is set to Never Expire. The synchronization of a password has no impact on the Azure user who is signed in. Your current cloud service session is not immediately affected by a synchronized password change that occurs while you're signed in to a cloud service. KMSI extends the duration of this difference. When the cloud service requires you to authenticate again, you need to provide your new password. Generally, password hash synchronization is simpler to implement than a federation service. It doesn't require any additional servers, and eliminates dependence on a highly available federation service to authenticate users. Password hash synchronization can also be enabled in addition to federation. It may be used as a fallback if your federation service experiences an outage. If you are migrating from AD FS (or other federation technologies) to Password Hash Synchronization, we highly recommend that you follow our detailed deployment guide published here. When you install Azure AD Connect by using the Express Settings option, password hash synchronization is automatically enabled. For more information, see Getting started with Azure AD Connect using express settings. 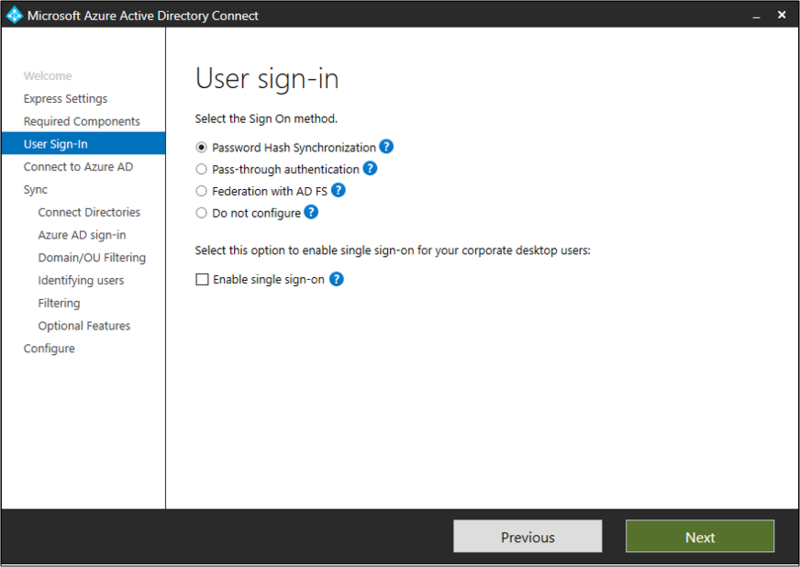 If you use custom settings when you install Azure AD Connect, password hash synchronization is available on the user sign-in page. For more information, see Custom installation of Azure AD Connect. For information about security and FIPS, see Azure AD password hash sync, encryption, and FIPS compliance. If you have problems with password hash synchronization, see Troubleshoot password hash synchronization.